On my first Saturday in Japan, I didn’t do a whole lot. Walked around for a few hours (again), heading up to Namba Station and not finding much there apart from a big golden concert hall or something. The weather was also crappy – overcast and spitting on and off. 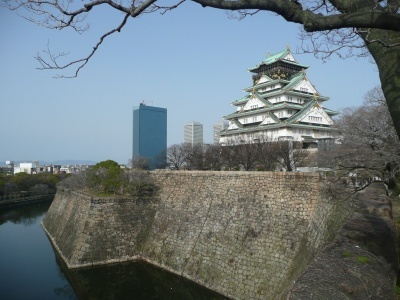 On Sunday, the weather was extremely pleasant, so I took advantage of the bicycles for hire at the hotel and rode to Osaka Castle. The central keep is a ridiculously beautiful building sitting in the middle of two concentric moats. Except for the keep, the whole area is open to the public free of charge and constitutes a very nice park. 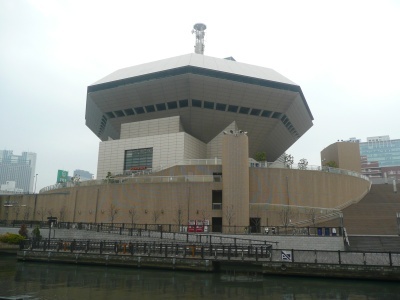 The keep is a museum and costs ¥600 to get in (that’s about £5). The museum isn’t terribly interesting – nor does it seem at all like the inside of a castle, apart from the cramped, square layout – but the top floor has a balcony all the way around which gives some good views of the city. On Monday, I went to see Guy Ritchie’s Sherlock Holmes, which – apart from being ridiculously expensive (about £15) – was entertaining and an interesting update of the Sherlock Holmes stories. Robert Downey, Jr doesn’t look at all like Sherlock Holmes, but still he did a decent job. The Holmes on display here was very childish in some ways; he also like to spend time bare-knuckle fighting between cases. Both facts are, if you think about it, realistic elaborations on the character. 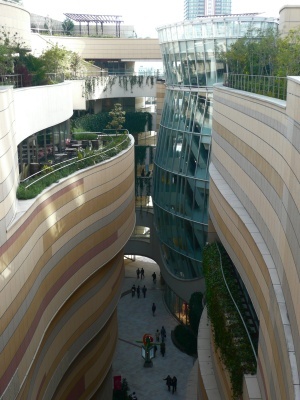 On Thursday, I spent a bit of time in a shopping mall near Namba Station (when I explored that area on Saturday I completely failed to find the main shopping area – basically because there are two Namba Stations) called Namba Parks. It’s a very modern building consisting of two parallel wings and not a single straight line in sight. As shopping malls go, it’s very pleasant. There are several bridges from one side to the other of the eight storey structure, most with a few seats. People seem to use them to take it easy for a while, read and so on. So that’s what I did, The Gathering Storm on my lap. Also on Thursday I heard from my colleagues that I might get my visa issuance number on Friday. We were hoping for it on Thursday, which would have meant I could have been home on Saturday, but, in the event, it came on Friday and this meant that with one day’s processing time, I could make it back to Korea until Tuesday. Saturday the 20th of March was the vernal equinox, so the Japanese had a day off on Monday in lieu of that. I needed to get some more money and book a few extra days at my hotel. The place I’d been staying at, Hotel Raizan South had no rooms free on the Saturday, so I asked in some of the neighbouring hotels and ended up at the Shinbashi in a slightly more expensive room (¥2500 a night). I tried both my Korean bank card and my Lloyds TSB credit card in a few cash machines I found in the nearby Tennoji area, but with no joy. On Friday morning, after I’d moved to the new hotel, I set out to find a Post Office, which I’d discovered accepted MasterCard cards. I was helped by a greeter at a bank called MUFG (which doesn’t stand for Manchester United Football Glub – but which does stand for Mitsubishi UFJ Financial Group). For the rest of my time in Japan I concentrated on finishing The Gathering Storm, uploading photos to my Flickr page and not spending too much money … no more Starbucks for me (until Tuesday, when I found I had a yen to burn). I dined regularly at a place called Yoshinoya, which serves simple rice and beef dishes, with side dishes if you pay extra; I also ate a lot of ramen and a fair number of bananas (which I found at a cheap little greengrocer, and which Habiba doesn’t let me eat at home). 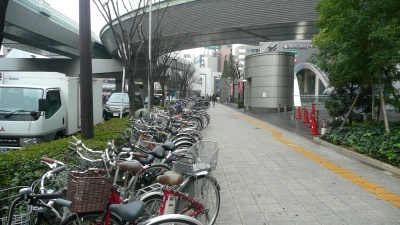 On Tuesday, I checked out of the Shinbashi at half nine and headed up to Namba. I was expecting to collect my newly envisaed passport from the consulate at one thirty and then to have to hurry to the airport to catch a flight at three fifty-five. That wouldn’t leave a lot of time to get from the city centre to Osaka Kansai. Anyway, I ‘thanked’ the visa woman right there in the consulate front office (I’m using the literal meaning of ‘thank’ … meaning I said, Thank you. … Just in case there was any confusion). And my new visa, the third I’ve had for Korea, was there in my passport all present and correct. I wandered around for a bit, bought a couple of things for Habiba (a pair of jars of Thai food paste, a dark Toblerone and some random Japanese snacks). At the airport I bought myself some presents – four tiny, nearly spherical waving cat figures. And then I flew home to Korea. All in all, it was a pretty tedious trip. I was minutely worried about the success of my visa application, but mostly I was just concerned about spending oodles of money. However, you can’t complain too much about having nearly two weeks off work. (Although I now have a pile of proofreading to do.) I still need to go to the Immigration office and pick up my Alien Registration Card and my workplace has to register me as a teacher. I also need to get my health insurance up and running – that will be, perhaps, the major benefit of getting my visa sorted out. Everybody at work made a point of welcoming me back. One of the team leaders – a guy who has very little English but is friendly and likes to try to talk to me – introduced himself to me, as if we were meeting for the first time. I feel that I’ve been a bit distant or grump at work. This is largely due to still being tired from the trip disrupting my circadian rhythm, but I think there’s also an element of being emotionally drained by the whole affair. Hopefully, everything will be back to normal (or better) in the very near future.